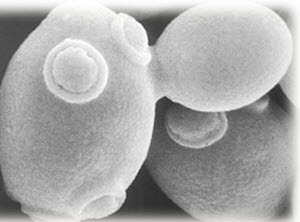 Yeast is a single celled microscopic organism, ranging in size 3 – 8um. 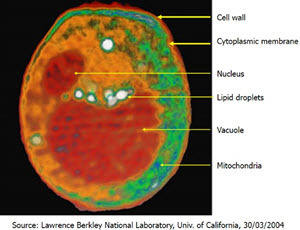 Cells of the baker’s yeast strain are typically oval in shape. A thin cell wall and inner membrane enclose the inner cytoplasm, where the nucleus, vacuoles, and cellular material are contained. The semi-permeable cell wall permits the passage of carbohydrates and other nutrients into the cell, while metabolic by-products such as alcohol carbondioxide are released. Under ideal growth conditions, which include a source of nourishment, warmth, and oxygen, yeast cells multiply rapidly by a process of budding. A bud starts as a small protrusion pushing out from the surface of the mother cell, and as the bud enlarges, the mother nucleus divides. Budding is completed when the fully developed daughter cell splits from the mother cell and is similarly then able to bud. Besides the use of yeast in the industrially important processes of baking, brewing and wine making, yeast is also a natural source of B vitamins. As one of the oldest leavening agents, the yeast used in baking is a strain of Saccharomyces cerevisiae, which was the first eukaryote to have its genome sequenced. The genome is composed of about 13,000,000 base pairs and 6,275 genes. It is estimated that yeast shares about 23% of its genome with humans.